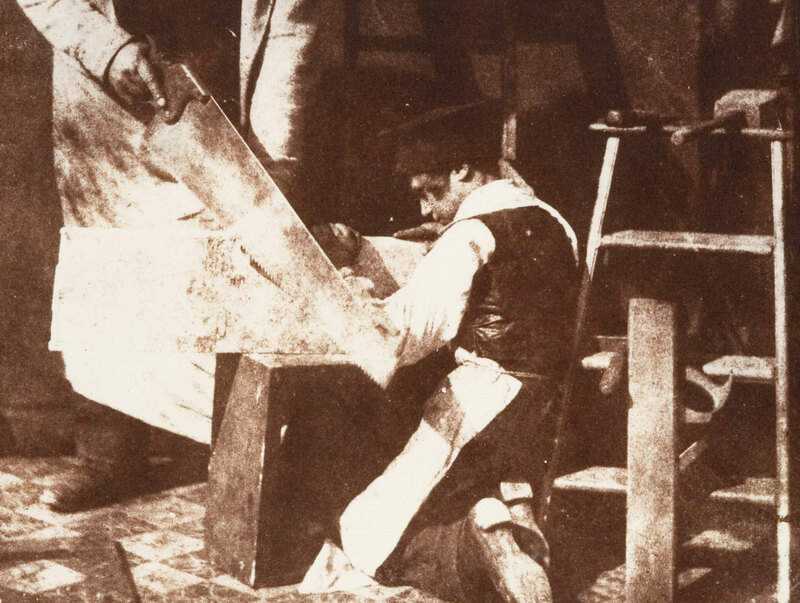 One of the earliest photographs I’ve ever seen of a carpenter at work is held by the Metropolitan Museum of Art and attributed to William Henry Fox Talbot, a British inventor and early photographer. Check out the full image here. Jeff Burks, who pointed me to the image, suspects it might be the earliest photograph of a carpenter/joiner. If you know of an earlier one, send us a note. 1. These early “calotypes” were staged because the exposure time could be extremely long (by modern standards). Hence the blurry face of the carpenter. The apprentice, however, held quite still. Because of the staging, I wouldn’t make too much of the workholding method (“Here boy, hold this board”). 2. This photo clearly answers a burning question: Should you store a plane on its side or on its sole? The answer: On its toe. 3. It’s nice to see the traditional three-finger grip on the saw’s tote. The saw looks fairly aggressive, more like a ripsaw, to me. In any case, be sure to visit the Met’s site and zoom around the photo. There are some nice details. However, I wish it were a daguerreotype. I presume that the fact he appears to be sawing through the width of the board while it’s held up on its side has to do with making it appear more clearly on the picture and, therefore, part of the staging of the photo? Still a fascinating image, though. That tote looks like the one on an old Spear & Jackson rip saw that my brother-in-law owns. It was brought over from the old country by an ancester in the 1860’s and is filed at an aggressive 3 1/2 tpi. If that image was taken by Fox-Talbot, it would be an early one. Fox-Talbot wasn’t just an early user of photography, he invented it. Some of the early exposure times were measured in hours rather than minutes. Handy if you wanted to take photographs of ghosts…..there are quite a few early examples of those…. Ye olde photographs weren’t just technologically limited in the sense of exposure times, but also the lack of portability ~ especially for indoor scenes that required lighting. Much portrait photography was staged in a studio. Hey, I’ve got one of those hold fasts here at home…It only works half the time and it’s turning out to be the most expensive one I own! Chris: I appreciate the photo and information – Thanks for passing it along. No comment on the apprentice’s hat? Of course it could be that using an apprentice as a work holding device was cheaper than outfitting a bench with the appropriate hardware. Well at least the plane wasn’t lying on its side…that’s SO twentieth century! I’m lovin the linoleum floor. Anyone know where I can get that pattern? I live only a few miles away from the Fox-Talbot museum at Lacock. I’ve visited once and often drive past it, Next month I’ll happen to be driving past on my way to a UK woodworking gathering. So if I have time, I’ll drop in and see if they have any more images to do with woodworking there.